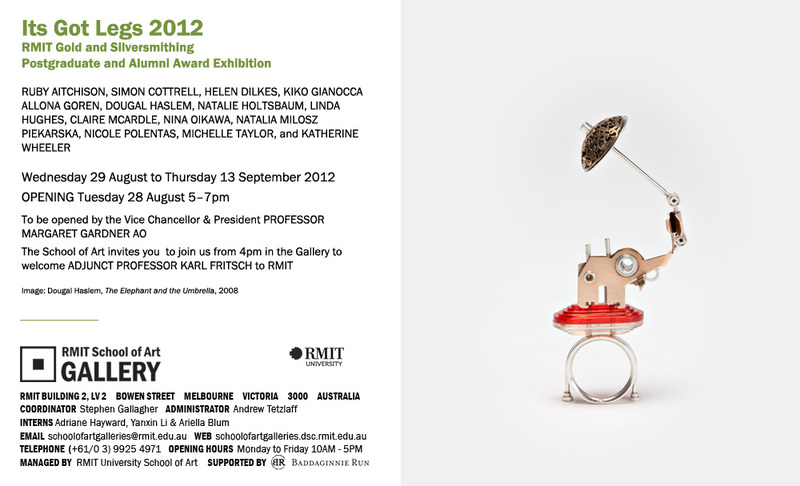 RMIT's Gold and Silversmithing Postgraduate and Alumni Award Exhibition It's Got Legs opens tonight from 5-7pm at the RMIT School of Art Gallery, Level B, Building 2, RMIT City Campus, Bowen Street. Congratulations to this year's participants and the award winners... to be announced tonight! The exhibition runs until 13 September. 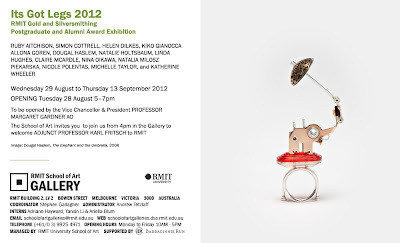 Congratulations to Simon Cottrell, winner of the Ronnie Bauer RMIT Postgraduate Gold and Silversmithing Travel Prize for his brooch Circle on More, and Natalie Hotlsbaum, winner of the Diana Morgan RMIT Alumni Gold and Silversmithing Prize for her work Honey Spoon!